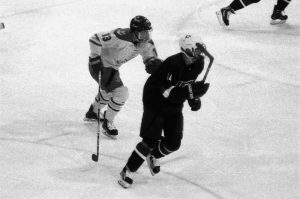 PITTSBURGH – After not being in the lineup Friday against Robert Morris, Ian Johnston was inserted onto the fourth line to try and generate some offense. The sophomore from Ottawa made himself be heard with his first goal in a Laker uniform as Lake Superior (5-13-4, 3-8-3 WCHA) claimed a 4-1 win over Arizona State (4-12-4, 0-0-0 Independent) in the consolation game at the Three Rivers Classic. Lake Superior ended their scoreless drought early in the first period as J.T. Henke continued his phenomenal senior campaign. Henke was muscled off of the puck by the Sun Devils; Arizona State failed to play the puck however and the Trenton, Michigan native collected it and put it behind Ryland Pashovitz. Just over 2:30 later, Arizona State tied it up with Tyler Busch’s seventh goal of the season. Despite generating 16 shots on Nick Kossoff in the first period alone, the junior netminder turned aside the rest of the attempts. The Lakers reclaimed their one goal lead Brayden Gelsinger slipped the puck through the five hole of Pashovitz. Gelsinger’s 5th goal of the season sent Lake Superior back to the locker room after one period with the lead. In the second period the Sun Devils, who generally have a difficult time getting shots on net, badly outshot Lake Superior 19 to 4. Consecutive penalties to Gage Torrel, Ryan Renz and Max Humitz in the first half of the period kept the Lakers on the defensive. The Lakers did not get their first shot on net until under 4:00 remaining. Despite the multitude of shots, Kossoff was not terribly tested, as most shots were from long range with little traffic. Early in the third period, Kyle Chatham made a clean centering pass from along the right boards directly to the stick of Johnston. The forward then lifted the puck over the left leg of goaltender Pashovitz, earning career goal number one. Down but not out, Arizona State continued peppering Kossoff, but failed to capitalize. The Lake State penalty kill performed well, limiting the Sun Devil chances, particularly on a 5 on 3 chance midway through the third. The Lakers salted the game away with an empty netter courtesy of Humitz, who carried the puck through the neutral zone and got the shot off from the blue line, as Lake Superior earned the 4-1 win. Thirteen different Lakers registered at least one blocked shot, with Collin Saccoman (6), Steven Ruggiero (4) and Kyle Chatham (3) leading the way. Kossoff finished the night with 48 saves. In the other net, Pashovitz stopped 17 of 20. In the championship game, 11th ranked Providence prevailed over Robert Morris to win the Three Rivers Classic. Kasper Björkqvist’s power play goal late in the second proved to be the difference, as the Friars (12-7-1, 6-4-1 Hockey East) prevented the Colonials (8-12-1, 7-7-1 Atlantic Hockey) from claiming a third straight title. Lake Superior will return home next weekend to face Bemidji State. The Beavers (9-6-5, 6-4-4-2 WCHA) swept their home series against Alabama-Huntsville (6-14-2, 5-9-2-1 WCHA).